MEMPHIS – The guarantee check was secured. So, trailing 35-7 at halftime 1,100 miles from campus against an FBS opponent, it would have been all good and understood had Alcorn State shut it down. There was nothing else to prove last weekend in Las Cruces against a New Mexico State team trying to squeeze another rare win out of a 2-7 season. The Braves had more meaningful battles ahead back home, on their own FCS level. They hold the inside track to an unprecedented fifth straight SWAC East division title they can clinch in the Nov. 17 season finale against rival Jackson State. Win that, and Alcorn State gets to host the Dec. 1 conference championship game. Alcorn State Braves head coach Fred McNair looks on from the sideline during the SWAC Championship football game between the Alcorn State Braves and the Grambling State Tigers on December 2, 2017 at NRG Stadium in Houston, Texas. Photo by Ken Murray/Icon Sportswire via Getty Images. Therefore, down by four touchdowns – with nearly two dozen fewer full scholarship players compared to the 85 that FBS-level New Mexico State can offer – Alcorn State had reasons to play it safe, avoid risking any injuries, turn to its backups and get out of town quickly and quietly. There was only one problem: that’s hardly the Braves' team Fred McNair has coached all season. The Braves rallied to within 38-35 in the fourth quarter before falling 52-42 in a loss that in no way registered as a defeat for anyone in the program. In addition to outscoring the Aggies 35-17 in the second half and outgaining them 654-529 in total yards for the game, Alcorn State notched its highest point total against an FBS-level team since 2004. Gaining momentum from a loss is a difficult task, but the Braves figured out a way. Now 7-3 overall and 5-1 in the SWAC, they enter Saturday’s bye after playing 10 games in as many straight weeks. McNair, a former Alcorn State quarterback and older brother of late NFL All-Pro Steve McNair, has the school from tiny Lorman, Miss. playing the most balanced and dominant football the SWAC has seen in years. They don’t give up. That’s one thing we talk about every day – finishing the fight. They could have easily said they weren’t going to play (hard) in the second half, but they toughed it out. It showed character to finish. The Braves rank atop of the conference in both total offense and defense this season. They’ve maintained a weekly presence among SWAC standout performances. Dual-threat quarterback Noah Johnson was named SWAC offensive player of the week after he accounted for 454 yards and four touchdowns at New Mexico State last Saturday. And tailback De’Shawn Waller earned SWAC newcomer of the week after he rushed for 137 yards and three touchdowns. McNair has seen drastic improvement from his team since the Braves suffered a 41-0 loss in the season opener against Georgia Tech, the first of two matchups with NCAA higher-division competition. Between that game and last Saturday’s performance, Alcorn State’s lone FCS setback came Oct. 6 in a 28-25 overtime conference loss to Alabama State. Otherwise, the Braves have beaten four league opponents by two or more touchdowns and also knocked off three-time defending SWAC champion Grambling State, 33-26. Last season, they became the first team in SWAC history to win four consecutive division crowns and are now closing in on a fifth. To do that against an FBS team, that’s big to play that kind of game against that kind of team ... It says a lot about this team, the way they want to finish this football season. Should they take care of business in their next two home games, the Braves will secure a spot in the Dec. 15 Celebration Bowl in Atlanta to play for the HBCU national championship. McNair didn’t need to travel nearly 1,100 miles to see where his team stood heading down the stretch of the season. In some ways, last week’s trip to New Mexico State only confirmed what he already suspected. When the Braves had every opportunity to fold, they instead fought. And they are only growing stronger by the week. So is evidence that this year’s SWAC title will run through Lorman. The Braves hold their destiny completely in their hands heading into a much-needed bye week after playing 10 straight weekends. All that stands between Alcorn State and another SWAC division title is a date in two weeks at home with in-state rival Jackson State, which pulled off a stunning upset against the Braves at the end of last season. The same stingy Rattlers’ defense that limited the previous five opponents to just 10.2 points per game was steamrolled in the first quarter as Howard notched 21 points right out of the gate. With FAMU’s five-game win streak snapped in a 31-23 loss on the road, the MEAC title and the league’s spot in the Dec. 15 Celebration Bowl remain up for grabs. Fifth-year senior Marquell Cartwright rushed for a career-high 183 yards and two touchdowns as the defending MEAC and HBCU national champion Aggies kept their repeat bid alive in last week’s homecoming win. A return to prominence will likely come by ground. This is the fourth straight season N.C. A&T has had at least two 300-yard rushing performances. Although Southern coach Dawson Odums knew his team needed a bye last week to rest up for the season’s stretch run, the last thing the Jaguars probably wanted was to disrupt their momentum. They resume play riding a dominant, three-game winning streak and control their own destiny in the SWAC west and for a spot in the Dec. 1 conference title game. There’s no better way to describe Howard than big-game hunters. Quarterback Caylin Newton, star receiver Jequez Ezzard and an opportunistic defense led by MEAC Co-Player of the Week Tye Freeland upset FAMU to add to their earlier win over Bethune-Cookman. If the Bison played the rest of the MEAC like they do against the Florida contingent, they’d be league champs. The contents of this page have not been reviewed or endorsed by the Memphis Grizzlies. 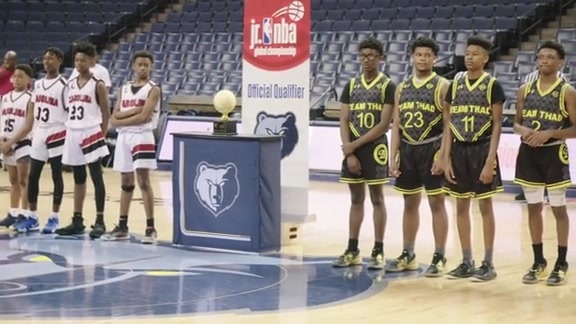 All opinions expressed by Michael Wallace are solely his own and do not reflect the opinions of the Memphis Grizzlies or its Basketball Operations staff, owners, parent companies, partners or sponsors. His sources are not known to the Memphis Grizzlies and he has no special access to information beyond the access and privileges that go along with being an NBA accredited member of the media.